Mark Bookman is currently a PhD student in East Asian Languages and Civilizations at the University of Pennsylvania. He came to Japan on a Fulbright Fellowship in the fall of 2014 and studied Buddhist philosophy at Toyo University for 10 months. He uses an electric wheelchair. The masses come and pay their respects as I gaze upwards towards a breathtaking mural on the ceiling. Closing my eyes for a moment, I try my hardest to capture the moment of sensational rapture – the thunderous footsteps, the muddled cries, the scent of incense – all of these in a single mental snapshot so that I might be afforded the opportunity to meditate upon at them at some later point. 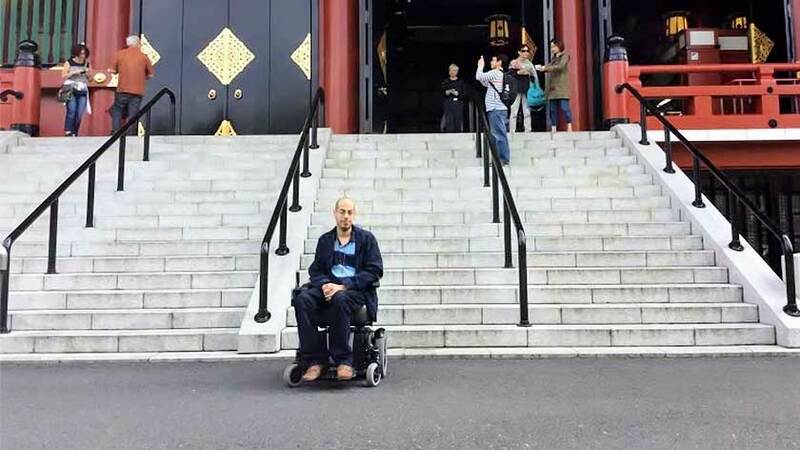 Here, at Sensō-ji, my wheelchair does not prohibit my taking part in an eternal rite of social confluence, and I finally blend in amongst the crowd of innumerable tourists and everyday commuters. Leaving the main hall, I cleave my way through the unknown faces of so many others who, like me, decided to go out for an afternoon stroll. I arrive at the elevator, only to disappear a few moments later into the streets of Asakusa. A bead of sweat forms on my slightly-furrowed brow as I recall that my disappearance is not merely a matter of my leaving the congregational space of Sensō-ji, but also a vanishing from the imagination of many of those same individuals with whom I co-inhabited that space. To be in a wheelchair in Tokyo is, in many senses, to be invisible. While station attendants and the general public are, on the whole, more than willing to assist wheelchair-bound individuals in isolated instances, the larger social and physical infrastructures are not readily accessible. Many apartments have raised entryways, or narrow doorways, or are unable to accommodate heavy-duty wheelchairs and other accommodations equipment. The same holds true for restaurants, hotels, schools, and a great many other spaces that individuals occupy. While these spaces may be modified, such modifications are both time-consuming and costly, thus limiting their feasibility – especially for those staying in Tokyo for a short-period of time who fail to qualify for “Care Insurance.” Still, with a strong social conviction for creating a barrier-free society, Tokyo has begun to eradicate even these systemic barriers and make all environs similar to that central hall of Sensō-ji that I so adored. At this juncture I would ask that you permit me a brief indulgence, dear reader, such that I might outline for you what my “average” day (to the extent that any day may be seen as “average”) looked like during my stay in Tokyo. By walking you through what I am sure is, for most, a rather mundane series of events, I hope to illustrate how even the ordinary may become extraordinary when experienced through the eyes and ears, tires and prosthetics of a disabled person living in Tokyo. Waking up at 8:00 AM, I proceed to elevate my “Care Bed” into an upright position such that I may sit up and call for my personal caregiver. As I am only staying within the country for 10 months, I have failed to qualify for “Care Insurance” and have funded my own caregiver to travel to Japan with me from the United States – a costly endeavor, but one necessary for my mission as a researcher in Japanese Religions. Then, my caregiver assists me in transferring to my wheelchair, and I manage to make my way out of my room towards the bathroom. I only scratch the floor a little and bang my rear wheel against the wall once this time – a success in my book. After reaching the bathroom (the door of which is too small for my wheelchair to enter), my caregiver lifts my 80kg body out of my chair and helps me bathe. After finishing my bath I decide that I would like to use the toilet, which is in a room that cannot fully accommodate my wheelchair. As such, my caregiver again lifts me up and positions me on the toilet. This time, I feel my chest crushed by my caregiver’s arms, and it hurts a little bit. Still, I use the toilet and, after having my caregiver help me get off the toilet, I return to my wheelchair and make my way to the kitchen. As I am unable to reach the stove, I ask my caregiver to prepare some breakfast for me and I gather my research materials for the day. After some time, my caregiver and I head out towards the train station. Upon arriving at the station, I ask the attendant if he would mind assisting me when I board the train. Honoring my request, he meets me on the platform with a ramp in tow. I thank him for his kindness and board the train towards my university. The train ride itself is rather peaceful, except that there’s no designated spot for wheelchairs in the car that I’ve been placed in and, as such, I’m in the way of most people trying to leave the train. I arrive at my stop and discover that there was a miscommunication somewhere along the line – there is no train attendant with a ramp to greet me. Thus, I continue to ride the train for another 4 to 5 stops until I reach a station that does not require a ramp for me to exit the train, I get off, and I find another station attendant. After explaining the situation to the attendant he assists me back onto another train, and after a series of events I arrive relatively unscathed at my destination. My caregiver and I make our way through the narrow streets to my school, and he helps me open the door to my classroom. Inside, I sit off to the side of the room; the desks are bolted in, so there’s no other choice, really. After enjoying a long day of classes, I prepare to return home. Along the way home, I decide that I would like to stop for dinner at a local restaurant. The first few restaurants I find all have raised entryways or stairs that my wheelchair cannot overcome, and I soon find myself desperate. When I’m about to give up, I stumble across a restaurant that can accommodate me and have a delicious meal prior to making my way back home. How glad I am that, after investigating upwards of 25 “barrier-free” apartments that were unable to accommodate me for some reason or another, I finally found one that I could call home! My caregiver helps me transfer from my wheelchair into my bed, and I do some light reading before going to sleep. I was lucky on this day, as I did not have any special events to attend for either my school or my sponsor. If I did, I might have been disappointed by being unable to attend – many venues are inaccessible. Above I have outlined my average day living in Tokyo. But what about when I wanted to go outside of Tokyo? Such excursions would take excruciating amounts of planning, and were often quite different from my expectations due to unforeseen physical challenges. Nevertheless, in all cases, one thing remained constant: the will of those around me to help and make an otherwise less-than-hospitable infrastructure more accommodating. This cultural imperative for creating a barrier-free society is truly inspiring and one that ought to be championed, for it facilitates an innumerable number of new and fantastic interactions for both native Japanese and foreigners alike. Having said that, I would be remiss if I failed to point out at this time one key problem with the mentality of accommodation as inclusion. First, it assumes that being wheelchair-bound or having other disabilities is a state easily cured via medicine or machines. Second, it requires that such machines be present – something of an infrastructural impossibility at the moment in Japan. I would like to suggest a different mode of thinking about disability. Not as a “problem” to be “cured” or “dealt with” but rather as an inherent part of all individuals trying to grapple with their unique circumstances. This is not to reject the idea of offering accommodations or medical treatments to those who need them, but rather to question the reason why those accommodations and treatments are offered. If we begin to think of all individuals as being disabled in some way and treat the existing infrastructure as a type of “accommodation” for persons traditionally thought of as “normal” or “healthy,” we might change the sorts of accommodations manufactured and reconsider how those accommodations are used going forward.